So without getting too worked up about the verb, 'resist', I'm pretty sure Cardinal Burke is just giving his ongoing position a precise, public stance. There is a limit and line on Papal power over which the Pope cannot step without betraying the Church and its Divine Founder while placing souls in increased peril. I would expect Cardinal Burke's 'resistance' to be rather like his current, still respectful and dignified attitude towards the Pope. This is, namely, to speak out publicly against any dilution or alteration of Church doctrine, even via 'pastoral practise', so as not to deny to Catholics today and to future generations of Catholics, as well as the rest of mankind, the fullness of truth, whole and entire, for mankind's Salvation. Although in today's current climate in Rome, Cardinal Burke appears to be doing something that for a Cardinal requires a bravery dependent on supernatural heroism, to defend - at the cost of even his own blood - the Church's teaching is in fact what every Cardinal and Bishop, priest and even lay person is required to do. It is, in fact, every Bishop's 'job'. To stand up for Christ has always come with an unusually high price tag. It wasn't cheap for the early Christians. We owe fidelity first to the Lord Jesus and we owe to the Apostles and all who came before us, and all who will come after us, as well as those Catholics alive today the truth of Jesus Christ and His Gospel, whole and entire. We owe fidelity to the Supreme Pontiff who, regardless of his gifts, talents, or personality, should never, by virtue of the Divine Person in whose place he stands, put the faithful in such a position that they feel they must choose between the teaching of Christ and the teaching of the Pope. The Pope is the Vicar of Christ and the Successor of St Peter, with all the authority and power that is invested in the person who holds that Office. The Pope is not, however, Almighty God and can no more reverse or alter what Christ has said, or what the Church teaches in Her doctrine in His name, than he can reverse or begin Time or create the Universe out of nothing. Pray for Pope Francis. 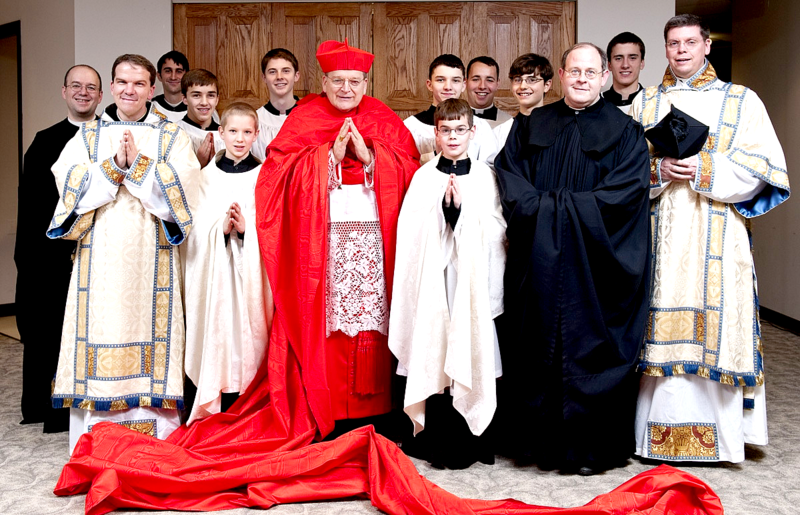 Pray for Cardinal Burke. This showdown can be avoided, if His Holiness chooses fidelity to Jesus Christ and the Law of God, over everything and everyone else. Madonna catechises the Grammy's audience with her quintessentially demonic dance routine. The gates of Hell can prevail without resistance over the Grammy awards. They cannot prevail over the Church of Christ. Nobody, not even the Pope himself, can alter the words of God Incarnate or act in such manner that they cease to mean what they say or are deemed to be no longer relevant to modern man. Equally, Catholics, Bishops and Cardinals first and foremost, but all Catholics also, cannot consent to or remain silent or be complicit if the family, marriage and the Church's doctrine comes under attack from within the Church, even if such is committed by the Pope himself. A Pope who makes himself Christ's rival or adversary, instead of His Vicar, must surely be resisted unto death. Resistance to grave evil is his duty, and ours. Blessed Michael, the Archangel, defend us in battle . . .
As Catholics we owe allegiance to Scripture, Revelation, and Tradition all as expressed in the Magisterium of the Catholic Church. So does the Pope. But he has a extra grave duty and responsibility. As Successor of Peter and therefore Keeper of the Keys he has a particular duty to guard, protect, cherish and ensure the Continuity of that Magisterium. You don't have to have a PhD in theology or whatever people have nowadays, to work that out. Now if a Pope teaches in error, and lets not kid ourselves, many have, ref. Michael Davies “A Heretical Pope, 1992, and “On Heretical Popes, James V Schall SJ., Cardinal Burke says he would resist, and he is right. What that resistance amounts to remains to be seen, but it could certainly include pointing out what the Magisterium says on any specific matter such as people in mortal sin being barred from receiving Holy Communion under pain of further mortal sin. But lets take Cpl. Jones' advice at this stage not to panic. After all the pope has not yet come down on one side or the other, yet? We will see at the second session of the Synod on the Family. Cardinal Burke would do well to restrain himself. To speak of a hypothetical and undefined resistance to the Pope must always be unbecoming in a Prince of the Church. I fear that the good Cardinal rather relishes the role of Leader of The Opposition and Fearless Upholder of Truth. A temptation which may be at least partly comprehensible, but a temptation just the same, and (given time and the wrong circumstances) a form of vanity. There are precedents. Perhaps but it has been two years now of 'what does the Pope think'? It might be that the Pope at the end of the Synod will alter and dilute nothing and that we will all have had nothing to worry about. "So why did you leave it two years to tell us that?" Remember Pope Benedict Emeritus called him a 'great Cardinal'. KARD. BURKE... I LOVE YOU !!! YOU ARE MY HERO!!! I share some of that frustration but I suspect that this Pope is developing a so-called "ecological" theology which deplores the culture of death as part of the throwaway degradation of our human civilisation. We will see when the Encyclical arrives but if I am right I think he will also uphold every crucial doctrine of the Church insofar as it touches upon human sexuality and marriage. In so doing he will be entirely in accordance with the Popes of the last 50 years in the glorious unbroken line flowing from Humanae Vitae which Francis has consistently hailed as prophetic. I do not believe the Synod will disrupt that continuity at all. fall short on doctrinal substance when he comes ( I admit belatedly) to articulate his coherent vision. Indeed, I think it may prove a rather splendid vision. I very much enjoy your blog, thank you for it. Anthony, Cardinal Burke has said nothing different than what Cardinal Robert Bellarmine once said. The latter is now a saint and doctor of the Church. If a Cardinal shouldn't remind the Pope of the limits of his powers, then who on God's green earth do you think should? The Pope has continually attacked the Faith and morals rather than uphold and teach same. It Is a grave sin not to resist the evil being spread throughout the Church and beyond. Dear Lord, help us. Deacon Augustine, as far as I know the Pope is not proposing to exceed the limit of his powers. Is it not then presumptuous to remind him of those limits? I think the Bishop of Rome's approach to evangelization would be better set to music so that it might be more easily understood both in the media and by the masses. May I suggest the following theme tune for the new 'catholicism? Of course you are free to choose Pepsi. Who am I to judge? Burke was the best bishop I ever had since becoming Catholic in 2003. He is a gentle and humble person but strict on dogma. He wouldn't let pro-abortion politicians to take Communion while he was my bishop in St Louis. I met him personally on 2 occasions. As to the pope, well he is a politician and he sees the handwriting on the wall. Too many conservative Catholics and clerics are calling him out on his liberal agendas. I suspect he'll conform to a somewhat more orthodox position on some issues----though his heart and soul are thoroughly liberal and progressive. What about the dogma on salvation which has 'evolved' for Fr.Zuhlsdorf ? No resistance here fron any one. What about the dogma on salvation which has 'evolved' for Fr.Zuhlsdorf ? If you can get rid of an infallible teaching you can get rid of anything. Hilary White on LifeSites quotes Cardinal Raymond Burke saying "I will resist". Yes - but Hilary White(LifeSites.com) and Fr.John Zuhlsdorf do not resist when extra ecclesiam nulla salus is discarded due to their being known exceptions to the defined dogma ( even when these exceptions refer to deceased persons). Of course the Eucharist should not be given to Catholics living in adultery and yes it should not also be given to Catholics who reject an infallible teaching in public. Anthony: I do not think it is a case of Cardinal Burke warning the Pope of certain limits but reminding the faithful of those limits. That is necessary and just. Many people are having their faith shaken, almost to bits, by the idea that basic teachings of the Church, such as that on marriage, might be changed by a Synod. The faithful need to be reminded and reassured that a Synod can make no infallible statement and that any attempt to do so must be resisted. Okay, it's all hypothetical at the moment (however, the very fact that we're even having to - very seriously and earnestly - discuss such hypotheticals is scary enough on its own) but I have a question. What does/will it mean, practically, for one to resist? How does one actually resist? Is it an interior resistance only or would it have an exterior evidence also? Basically, what will it entail, on that first post-Synodal Sunday morning, if it comes to it and we're faced with the worst, for one to "resist"? Like, after I've got out of bed, what do I do in my new state of resistance? Where do I go? I guess resistance means we'll all have to go to SSPX or independent sedevacantist chapels. Personally, I think LeFebvre and Burke will be canonized someday. Even with them there is a problem. 1. Stay calm. A synod has no power to make an infallible statement on faith and morals - see Lumen Gentium - so if it purported to do so it would acting ultra vires and should be ignored i.e. such statement should not be accepted. 2. There is no need to go into any kind of schism - it is others that will be in schism if they accept such. 3. Protest to your Parish Priest at the earliest opportunity i.e. after the Sunday Mass that this behaviour by the Synod is unacceptable. 4. Protest to your Bishop in writing. 5. Protest to your local Nuncio in writing. 6. Take every opportunity to tell the truth. 7. Consider refusing to support financially or otherwise any clergy who support what the Synod has said. Thank you, Nicholas, you have amply outlined the realistic extent of post-Synodal practicalities that would face those who would “resist”. And, generally speaking, your outline (which I agree with) would mark no discernible difference from the experiences of many over the last 50 years. Certainly, if the Synod presses the nuclear button, it must be ignored. It will just be another item to add to the long list of ignored things. I agree that those who would lend support to any perceived rupture would be the ones in schism. But it will just be another aspect of the all pervasive schismatic mentality that (I’d say) already infects the majority of clergy and faithful. I agree that, in theory, it would be wise to write to one's PP - but it's pointless for me (that's not despair, just an accepted reality based on much local experience). Similarly, I would agree that, again in theory, it might be an option to write to one's bishop - but again it's pointless because my Archbishop has already declared support for the ACTA movement (doing so at exactly the same moment that he, apparently unwittingly, ensured the cessation of the only weekly Sunday and major feast day parish-based EF in the city region of the Archdiocese). Moreover, he has expressed hopes that "great things" will emerge from the Synod (one must extend the benefit of the doubt there, given the ambiguity as to what "great things" might mean). And his attitude towards the subject of "women priests" - or the continuing debate (even though we were told decades ago that the subject was closed) is questionable. On balance, then, and given recent experience, I would say it would be pointless writing to my Archbishop (that wouldn’t necessarily go for everyone, of course). But I can live with that. It's a bleak situation I’m well resigned to. About writing to the Nuncio: yes, possibly mileage there. About taking every opportunity to tell the truth: agreed, even on blogs! About financial realities: I have long since ceased supporting any Church activity (save for Aid to the Church in Need) that doesn't smell of Ecclesia Dei. About praying: yes, much improved work to do. I must be honest. So, really speaking, apart from resolving to pray more (no small thing! ), and possibly writing to the Nuncio, there won't be much change for this potential "resister". Things will carry on, post-Synodally, much as they have for years (even if the unthinkable happens - and although we know deep-down that such a doctrinal rupture simply can’t happen, I'm of the belief that it doesn't really matter to those who are hell-bent on sowing confusion, for their big prize will simply be to change pew perceptions and create "a Spirit of the Synod"). It will still be a case of attending any EF Masses one can and accepting that, in the eyes of the majority of fellow Catholics, I’m a "crank who can't move with the times". In other words, pretty much "as we were”. I wouldn’t advocate anyone taking overt schismatic (in intention) actions (but where lies unity?). I was merely wondering aloud as to what, if any, practical difference we would notice in any Post-Synodal meltdown, especially now that Cardinal Burke has used such a strong word. Nothing much will seem different. Those who will seize the opportunity to blur dogma, devalue the sacraments and generally cause confusion and scandal will attend their Masses and "live Church" the way they think She is and want Her to be. As they have for decades. It won't matter that the "cranks" who attend antique Masses accuse them of being schismatic. We’re there to be ignored, much like we’ll ignore the Synod. A score draw! And we'll all rub along giving at least the impression of unity - under the guidance of the Bishop of Rome - much as we do now. So, the rhetoric might go up a notch - "resist" is a serious concept - but October will become November, Advent and Christmastide, and next February we'll all still be One True Church. Together. If the Pope takes a disciplinary decision one objects to, what is the proper response to such a decision? Well, it would make no sense to throw in with some vagus bishop (orders but no jurisdiction) or to throw-in with Rev Cekada's clan -sedevacantism. No, rather, one must maintain the Bonds on Unity in Worship, Doctrine, and Authority which is the sine qua non of Catholicism. If any man seeks a reason for these troubles, look no further than to one's own self; we are given the prelates we deserve and it is owing to his own sins that we have so many Prelates Raider Fan would rather not have. If the Pope takes the decision that many (R.F. too) fear is possible, then what is R.F. to do? Stand-up and boo when known adulterers are dispensed Communion? If you believe that, you believe the promises of Christ were without force and efficacy. the constant custom of the church demonstrates it, and the ecumenical councils, particularly those in which East and West met in the union of faith and charity, have declared it. sacred scripture and the apostolic traditions. reverenced and followed by all the holy orthodox doctors, for they knew very well that this see of St. Peter always remains unblemished by any error, in accordance with the divine promise of our Lord and Saviour to the prince of his disciples: I have prayed for you that your faith may not fail; and when you have turned again, strengthen your brethren  . Cardinal Burke has a right and a duty to 'resist' what may be coming from this 'Sin-Od' on Marriage. Remember, this is a hypothetical question. And if it is any indication by Francis own words on the matter, many times documented, resist we all may have to. 'May' have to, but the 'indications' that we have to date are not promising. No of course, Francis will not attempt to 'change Doctrine' and will leave Doctrine solidly as it is, but will leave it in the hands of individual Bishops to interpret their own 'Pastoral Approach' to Doctrine, encouraging them to focus on 'Mercy' and 'Inclusiveness'. When you tweak the approach to Doctrine, you essentially tweak the Doctrine itself. Francis will encourage the Bishops to look at 'individual situations' and act accordingly. It will be in this 'back door approach' that he will be able to move Doctrine in the direction of the 'evolution' that he and those that surround him are constantly and publicly talking about. The message is unmistakable: 'Doctrine evolves'. You see that is the thing: we have NO idea if the pope will continue down this dangerous heterodox road and continue to allow heretical ones to be loose cannons or if he will uphold firmly to the teachings of the Church and, frankly, there are odds on that. Many faithful do not trust him and feel he does not love his faithful children in any case. So we must keep our eyes on Christ! I think the PhD equivalent is "Doctor of Divinity" or D.D. And ensure children are properly educated in Faith and morals by homeschooling, or joining together a number of families with faithful teachers. Very few "Catholic" schools are providing the necessary Catholic education, and education based on objective moral truth; rather, they are agents of indoctrination in evil ideologies from the state. Gregory said: And, generally speaking, your outline (which I agree with) would mark no discernible difference from the experiences of many over the last 50 years. In other words, nothing much is going to happen except that people who stand for the truth will be looked at by the majority of Catholic cardinals, bishops, priests, and laity as "being against the pope" and "schismatic" when in fact the opposite would be true. The good will be called the bad, and the bad will be glorified. What a grave, diabolical situation we have in the Church. I have just seen that Cardinal Burke will be visiting England next month (LMS blog)though unfortunately for us down south he does not appear to be visiting London. However he will be celebrating Mass in Ramsgate. You could see the pain he was in. It was palpable.